BendPak HDSO-14AX Extended Open Front Four Post Alignment Lift 14,000 lb. We engineered our HDSO-14AX model without a front cross bar, so operators can easily enter and exit from beneath the vehicle. Now the process of front-end adjustment becomes quick and trouble-free. 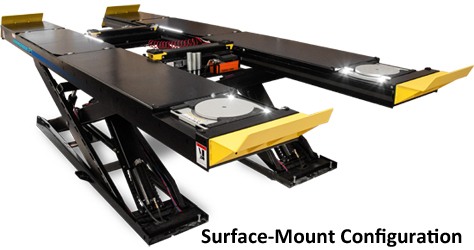 This is a must for busy alignment bays. 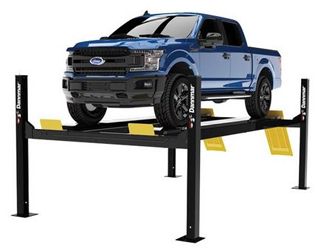 Additionally, for precise front-lift leveling, nothing beats our patented adjustable front outrigger tubes. The infinitely adjustable pitch compensates for excessive loads and sloped floors. Standard Motor (**) 220 VAC / 60 Hz. 1Ph. * May vary depending on wheel size. ** Special Voltages Available Upon Request. The design, material and specifications are subject to change without notice. 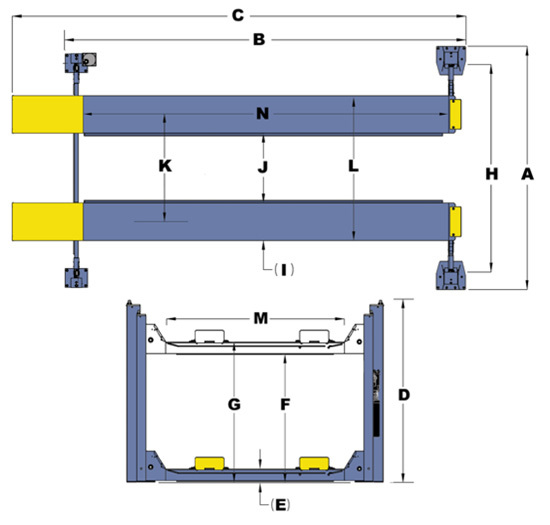 *Not all BendPak lift models meet the standards as prescribed by ANSI/ALI ALCTV (Current Edition)or ANSI/UL 201. Consult www.autolift.org for a complete list. Duration: From the date of purchase by the original Purchaser or 60-24-12 months from the date of shipment by BendPak or whichever comes first. What is covered under this warranty: manufacturer defects due to material and/or workmanship with the exceptions noted below. Items or service normally required to maintain the product, i.e. lubricants, oil, etc. In some cases, components may be required to be shipped to the nearest BendPak Authorized Service Center. Freight costs, after 12-months, must be borne by the Purchaser. Use reasonable care in the operation and maintenance of the products as described in the owner¡¯s manual(s). When Warrantor will perform repair or replacement under this warranty: Repair or replacement will be scheduled and serviced according to the normal work flow at the servicing location, and depending on the availability of replacement parts. *Free-shipping applies to direct shipping points within the 48 continental United States. Rural area shipping surcharge may apply for remote addresses. **For all BendPak brand two-post and four-post surface mounted lifts manufactured on or following 1/1/2011. In no event will either party be liable for any damage caused by the other party's failure to fulfill its responsibilities under these terms and conditions. In no event will either party be liable for any lost profits, lost savings, incidental damage, or other economic consequential damages. All expressed and implied warranties, including the implied warranties of merchantability and fitness for a particular purpose, are limited in duration to the coverage period. No warranties, expressed or implied, will apply after this period. BendPak may modify these terms and conditions at any time by either providing the customer with written notice or posting such revised terms on www.bendpak.com. Such revised terms shall be effective thirty days from the date of such written notice or posting.